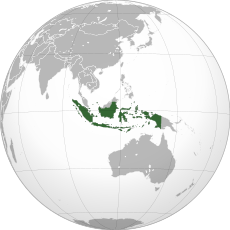 Indonesie (pronounced /ˌɪndoʊˈniːziə/ (deprecatit template) or /ˌɪndəˈniːʒə/), offeecially the Republic o Indonesie (Indonesian: Republik Indonesia), is a kintra in Sootheast Asie an Oceanie. Indonesie comprises 17,508 islands. Wi a population o aroond 238 million fowk, it is the warld's fowert maist populous kintra, an haes the warld's lairgest population o Muslims. Indonesie is a republic, wi an electit legislature an preses. The naition's caipital ceety is Jakarta. The kintra shares land borders wi Papua New Guinea, East Timor, an Malaysie. Ither neighborin kintras include Singapore, Philippines, Australie, an the Indian territory o the Andaman an Nicobar Islands. Indonesie is a foondin member o ASEAN an a member o the G-20 major economies. The Indonesian archipelago haes been an important tred region syne at least the seivent century, when Srivijaya an then later Majapahit tradit wi Cheenae an Indie. Local rulers gradually absorbed foreign cultural, releegious an poleetical models frae the early centuries CE, an Hindu an Buddhist kinricks flourisht. Indonesian history haes been influenced bi foreign pouers drawn tae its naitural resoorces. Muslim traders brought Islam, an European pouers focht ane anither tae monopolize tred in the Spice Islands o Maluku durin the Age o Diskivery. Follaein three an a hauf centuries o Dutch colonialism, Indonesie secured its unthirldom efter Warld War II. Indonesie's history haes syne been turbulent, wi challenges posed bi naitural disasters, corruption, separatism, a democratization process, an periods o rapid economic chynge. The current naition o Indonesie is a unitary presidential republic consistin o thirtie three provinces. Athort its mony islands, Indonesia consists o distinct ethnic, linguistic, an releegious groups. The Javanese are the lairgest—an the politically dominant—ethnic group. Indonesia haes developed a shared identity defined bi a naitional leid, ethnic diversity, releegious pluralism athin a majority Muslim population, an a history o colonialism includin rebellion against it. Indonesie's naitional motto, "Bhinneka Tunggal Ika" ("Unity in Diversity" literally, "mony, yet ane"), articulates the diversity that shapes the kintra. Despite its lairge population an densely populatit regions, Indonesia haes vast auries o wilderness that support the warld's seicont hichtest level o biodiversity. The kintra is richly endowed wi naitural resoorces, yet poverty remains widespread in contemporary Indonesie. ↑ The govrenment offeecially recognises anerly sax releegions: Islam, Protestantism, Roman Catholicism, Hinduism, Buddhism, an Confucianism; awtho the govrenment an aa offeecially recognises Indonesie indigenous releegions. ↑ "Indonesia" (Country Studies ed.). US Library of Congress. Retrieved 3 February 2017. ↑ "Ethnologue: Indonesia". ethnologue.com. Retrieved July 21, 2017. ↑ Yang, Heriyanto (August 2005). "The History and Legal Position of Confucianism in Post Independence Indonesia" (PDF). Marburg Journal of Religion. 10 (1): 8. Retrieved 2 October 2006. ↑ "Pemerintah Setuju Penghayat Kepercayaan Tertulis di Kolom Agama KTP". Detikcom. 2017-05-08. Retrieved 2017-07-11. ↑ "World Population Prospects: The 2015 Revision". United Nations Department of Economic and Social Affairs. ↑ 10.0 10.1 10.2 10.3 10.4 "Report for Selected Countries and Subjects: Indonesia". World Economic Outlook. International Monetary Fund. ↑ "GINI Ratio Indonesia Declines: Economic Inequality Narrows". Indonesia Investment. Retrieved 6 April 2017. ↑ "Human Development Report 2016: Human Development for Everyone" (PDF). United Nations Development Programme. Retrieved 25 March 2017. ↑ "Poverty in Indonesia: Always with them". The Economist. 14 September 2006. Retrieved 26 December 2006. ; correction. This page wis last eeditit on 22 Apryle 2018, at 22:49.